Who is this Kitty Bridges? 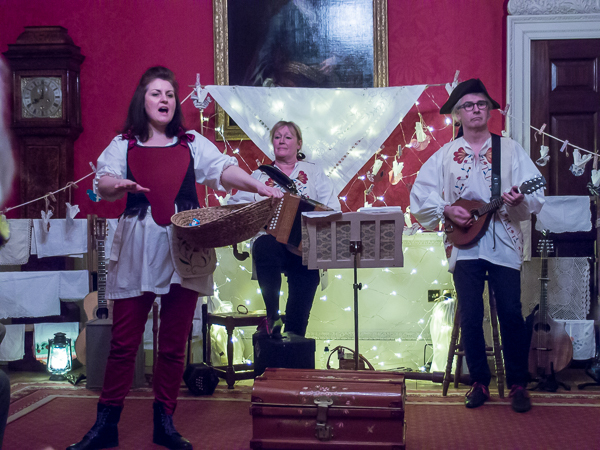 – Common Ground Theatre’s performance at Fairfax House, 7th March 2015. Cats are said to be the perfect pet for translators, sitting all day long on our lap. However, this Kitty may not be that easy to tame. Chapter I – in which the audience is introduced to the artists. Hannah Davies, as Kitty, as Monsieur Le Quiff, as Emilia, as Doctor Zupan and many more, gave each of the characters their own voice and personality. Members of Over the Yardam, Paul Baldwin on the mandolin, the banjo and many more, and Moira Clarke on the concertina, the melodeon and many more, accompanied the narration with joyful tunes. Chapter II – in which the audience is introduced to Kitty Bridges. Nobody knows whether she was the author of the book or the muse who inspired it. But the storyteller tells us, Kitty Bridges is a foundling, a feisty young lass from Yorkshire who goes on an incredible adventure. From Yorkshire to London, from a tavern to a mansion, working, travelling on carriages, singing, dancing, inspiring, helping, escaping danger, making good friends and not so good friends, stealing, running away, going back home and finally leaving again; this is how Kitty’s life occurs. Her story is a chant to freedom, a play about music, greed and ownership. The Book of Tunes is a small pocket book from 1745 found a couple of decades ago with 21 tunes and dances to go along. We know it actually belonged to Kitty Bridges thanks to a poem on the first page, which has her name spelt out as the first letter of each verse. 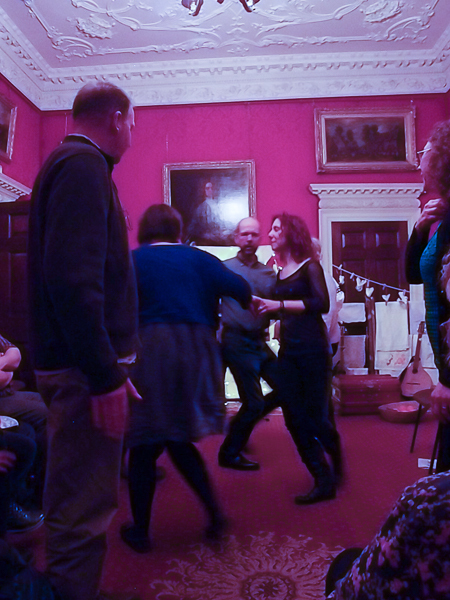 After the play, some of us had the opportunity to stand up and dance a bit to the beat of folk music. Following Hannah’s and Moira’s instructions we performed two dances from the period in pairs, and according to the company, our group was one of the most skilled ones. And you can see that we learnt, indeed! Chapter V – in which the few YTI members wished more colleagues would have joined. And this Chapter speaks for itself. ‘Protect your Business’, the YTI’s latest CPD event, was held on 28 February at the University of Leeds. The event addressed the various types of threat to which freelance translators and interpreters are vulnerable, offering advice and strategies for countering them. An introductory exercise saw attendees gather together in small teams to identify different threats to the average freelancer’s business. Their ideas were then fed back to the whole room and a substantial list of threats was drawn up. Figuring prominently among these were technological failures, the loss of a regular client, and personal injury, all of which would be revisited during the course of the day. The first talk, centred on protecting your income, was given by Andrew Leigh, specialist legal translator, YTI and ITI member, and current ITI board member. Andrew began by considering the importance of acquiring and retaining a sensible mix of good clients. It is crucial not to rely on too a small number of clients for all your work (‘putting all your eggs in one basket’). Client reputation and payment history should also be considered; there are forums available for investigating this, including (for UK companies) Experian, to which ITI members have free access. Andrew also stressed the importance of terms and conditions covering, among other things, delivery, copyright/IP, cancellation, payment, confidentiality, liability and complaints. A good understanding of late payment laws (both in the UK and abroad) would also stand you in good stead for protecting your cash flow. In the UK, the relevant piece of legislation is the Late Payment of Commercial Debts (Interest) Act 1998, entitling you to charge interest and impose a fixed debt recovery charge. Next Andrew touched on income protection insurance (an insurance payout to cover lost income if you find yourself unable to work). You can set the amount in accordance with your own personal circumstances, although it should be borne in mind that the maximum is 60% of your income and that a deferred period of at least four weeks must elapse before the first payout. Finally, Andrew invited attendees to seriously consider registering their business as a limited company. You would, of course, have to pay corporation tax and produce annual accounts, but the benefits are substantial: limited liability (your personal assets will not be attacked), payment in effectively tax-free dividends and a certain measure of commercial respectability to name a few. 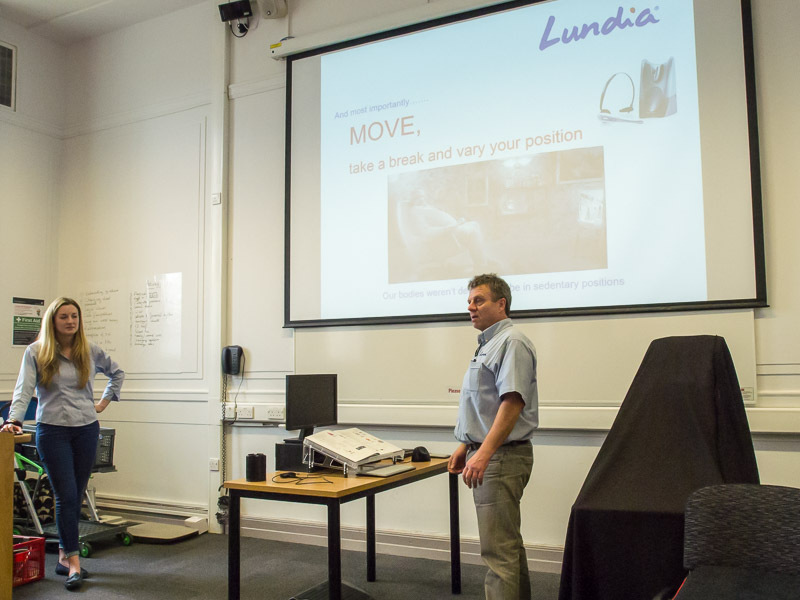 Following a coffee break (we had the opportunity to bond over the underperforming hot water dispensers), we were treated to a talk by a father and daughter team representing Lundia, a Yorkshire-based company selling ergonomic home and office furniture. We were given a short master class in the correct seating posture for using a computer: knees lower than hips; feet flat on the floor without undue pressure on the thighs; a 2-3 fingers gap between the front edge of the seat and the back of the knee; the desk at elbow height; and the upper edge of the monitor at eye level. Among the more intriguing items of ergonomic furniture were the backless ergonomic stool, designed for optimal positioning of the spine, and the so-called ‘Steppie balance board’, a board with a gently curved base for use with a standing desk, encouraging slight movement in the legs while working. Indeed, the overriding message was that regular movement is essential. Whether by getting up regularly to raid the fridge or alternating between sitting and standing to work (I was struck by how many of the professional freelancers present already do this), ensuring that you are moving throughout your working day is crucial to protecting your health in both the short and long term. This of course has implications for income protection too. It was then time for the networking buffet lunch where we had ample opportunity to get to know fellow freelancers while stocking up on an excellent range of sandwiches and cakes. Lunch was followed by a talk from Towergate Insurance’s Harpreet Sahota (who had travelled all the way from Luton via Liverpool!). 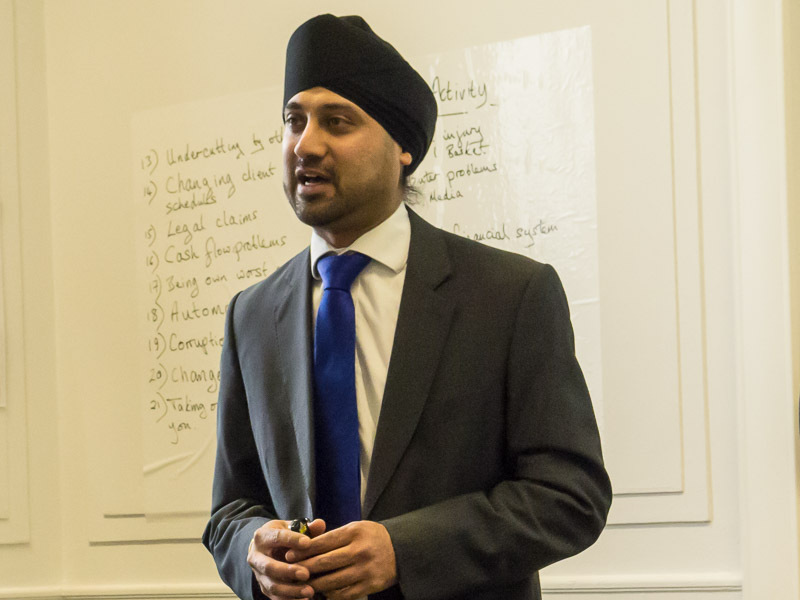 Harpreet spoke about professional indemnity insurance as well as other forms of insurance, including home insurance and income protection insurance. Recognising that most translators would probably not be in a position to be sued for millions, some insurers offer less expensive professional indemnity insurance packages for translators, with a more realistic level of cover. Working from home may also have implications for home insurance (there were differing views within the room as to whether insurance would cost more or less as a result). Those who need to travel to their clients by car may also require business use cover on their vehicle insurance. Harpreet strongly recommended contacting an insurance broker in person to discuss the options available, rather than relying solely on the internet. 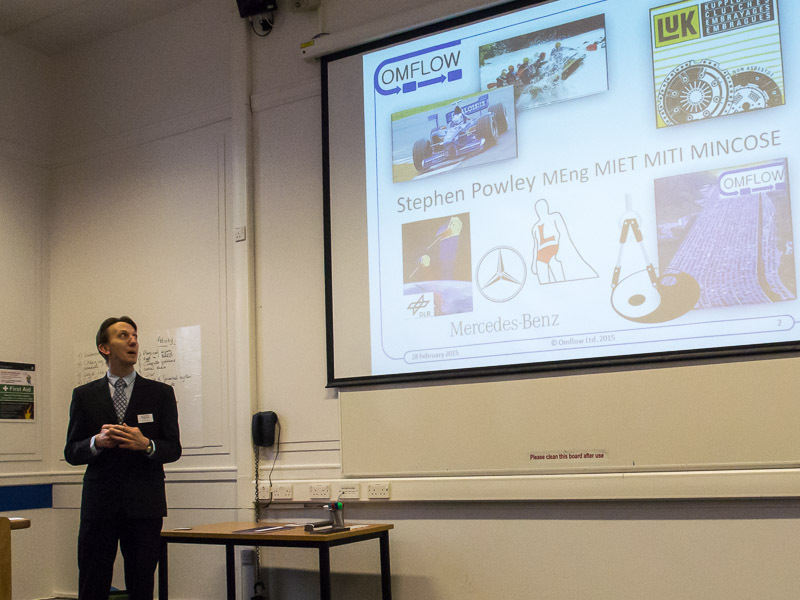 After a final coffee break, it was time for Stephen Powley, MITI and engineer, to speak about protecting against both the loss and misuse of data. Stephen discussed the possibilities for backing-up data, which ranged from a spare computer or external hard drive to network-attached storage and cloud-based storage (Google Drive, Dropbox, and equivalents). Regarding cloud storage and online MT systems, Stephen emphasised the importance of checking the software’s end-user license agreement (EULA) and terms of service (these can be difficult to find!) and considering the implications for privacy and data confidentiality. Similarly, when installing individual apps on your smartphone, you may wish to check what permissions you are giving them (many collect information such as location, personal data, photos etc.) and even install a third-party gatekeeper which acts as a firewall for your phone. The importance of passwords was also brought to the fore. Stephen recommended creating a private algorithm, known only to you, which would allow you to create and remember individual passwords for a multitude of different websites; he provided us with a clever example: amP@s5AZw0rD! Including numbers, capital letters and special characters in the same password is also a very sensible idea. Andrew Leigh returned to conclude the day’s business by inviting attendees to reflect on ways for freelancers to protect their professional and online reputation. Needless to say, translators and interpreters should do their best work. But they should also only accept work in their chosen field(s), submit queries where necessary, be punctual and professional in their responses, and deliver on time. Andrew also advised that translators use an external proofreader and build the cost of this into their quotes for direct clients. Online reputation can be protected by the wise and careful use of social media. Separate business and personal profiles are recommended for sites such as Facebook and Twitter, and not mentioning clients by name (if at all) is a must. YTI’s event was followed by a TweetUp and drinks at Leeds’ Behind the Town Hall.